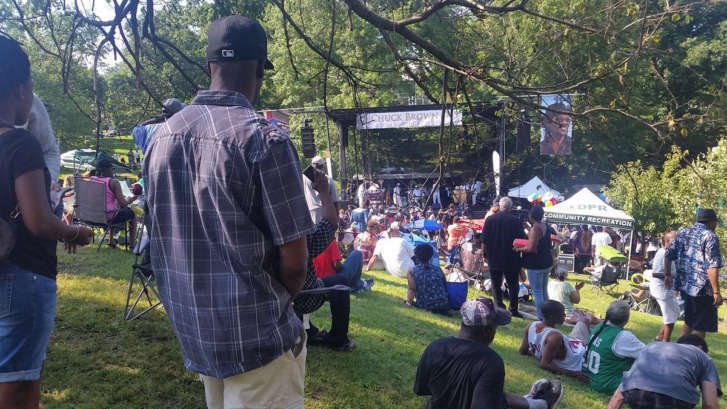 On Saturday, a celebration for D.C. music icon Chuck Brown and his would-be 81st birthday took place at a park that's named in his honor. WASHINGTON — This coming Tuesday would have been the “Godfather of Go-Go” Chuck Brown’s 81st birthday. But on Saturday a celebration for the D.C. music icon was taking place at a park that’s named in his honor. At the Chuck Brown Memorial Park in Northeast, D.C. his legend carries on with the celebration of the third annual Chuck Brown Day. It’s a day full of bands playing his music and his fans up dancing or grooving in their lawn chairs or on their blankets. This was the first Chuck Brown Day that Dorothy Shipman and her friend Bernadette Allen attended. They’re both from Largo, Maryland. “It’s a family oriented event and (has) good music. And so I love Chuck Brown,” Shipman said. She said her mother loved Brown and used to listen to him all the time. And that’s where she got her love for his music. “His music was just, oh my gosh, it would just get you moving, dancing, bopping your head, stomping your feet. And he’s been around a long time,” Shipman said. Allen said Brown’s music is multigenerational. “His music has gone from generation to generation, from the oldest of the oldest to the youngest of the young,” Allen said. Brown was born on Aug. 22, 1936 in Gaston, North Carolina. He lived in poverty throughout much of his childhood. Brown, a guitarist and singer, is known as the creator of Go-Go music. Brown died in 2012. “Chuck Brown and Go-Go. He’s just an icon and a legend. A true legend,” said local radio DJ Chris Paul with Majic 102.3. Paul said that whenever Brown was around, there was a feeling of love, family and togetherness.